Western blot analysis of extracts from various tissues and cell lines using Calretinin (E9R6G) Rabbit mAb (upper) and β-Actin (D6A8) Rabbit mAb #8457 (lower). Immunoprecipitation of Calretinin protein from mouse brain tissue extracts. Lane 1 is 10% input, lane 2 is Rabbit (DA1E) mAb IgG XP® Isotype Control #3900, and lane 3 is Calretinin (E9R6G) Rabbit mAb. 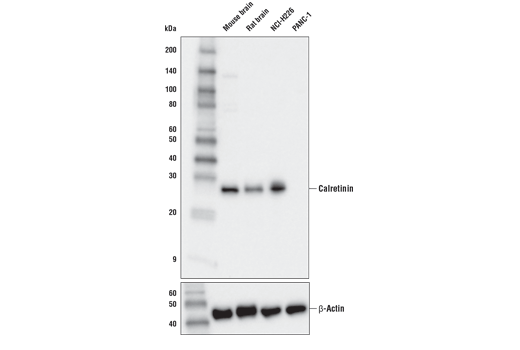 Western blot analysis was performed using Calretinin (E9R6G) Rabbit mAb as the primary antibody and using a light chain specific secondary antibody. 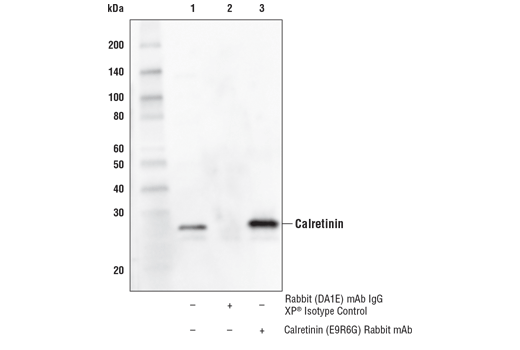 Calretinin (E9R6G) Rabbit mAb recognizes endogenous levels of total Calretinin protein. Monoclonal antibody is produced by immunizing animals with a synthetic peptide corresponding to residues surrounding Glu149 of human Calretinin protein. Calretinin (29 kDa calbindin, calbindin 2) is a calcium-binding protein of the EF-hand family encoded by the CALB2 gene. It is differentially expressed from homologous family member calbindin-d28k in distinct neuronal populations of the retina, auditory system, and cerebellar granule cells (1, 2), and acts as a marker for specific neuronal subsets of the subthalamic nucleus and the substantia nigra (3). Calretinin has been shown to play an important role in modulating neuronal excitability and the induction of long-term potentiation (1). Research has shown that, pathologically, calretinin is a selective marker for epithelial mesothelioma, making it a diagnostic tool to differentiate from adenocarcinomas (4). Camp, A.J. and Wijesinghe, R. (2009) Int J Biochem Cell Biol 41, 2118-21. Rogers, J.H. (1987) J Cell Biol 105, 1343-53. Fortin, M. and Parent, A. (1996) Brain Res 708, 201-4. Gotzos, V. et al. (1996) Pathol Res Pract 192, 137-47.